Geez, I haven't shared a sewing post with you in a month. Totally not reflective of what I've been up to. 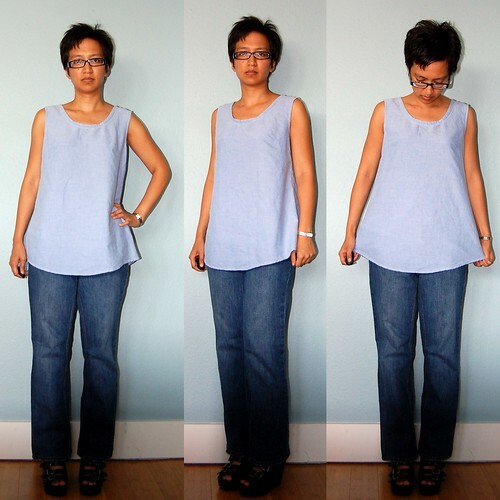 Let's start with a simple tank-style woven top and altered jeans. The tank is a refashioned men's shirt (short sleeve button down and SOFTASALLGETOUT) and the jeans were a standard pair of bootlegged Banana Republic jeans I have not worn because the bootlegs never really worked for me. It doesn't look like much, but the cool story about the top is that I decided to experiment with DRAPINGPAPERDIRECTLYONTOTHEFORM. That's right, no draping fabric, transferring to paper, creating lots of inaccuracies and imprecisions, etc. etc. I kept things simple and draped paper right onto the form, folded out one bust dart, etc. The draped paper pattern has a side seam that falls straight from the bottom of the armhole to the bottom hem, but I kicked it out for an a-line shape when I saw how much width from the original shirt I'd be wasting. Also, I am not sure how, but my bust dart is a bit too long. Darts are supposed to end 1" or so from the apex, and mine go nearly right up to said apex. I'll have to change that on the pattern for next time. I don't have nearly enough tunic-length tops so I am excited about the potential for this simple pattern. Oh, and there's a photo of the original shirt here. The jeans are a whole different story. I attended a denim alterations workshop in June and started working on skinnifying and shortening the legs on this pair of jeans that fit like a glove around the waist and hips. The heat came and I never felt like cooking, I'd been vegan for a month or two but didn't have a good enough repertoire of recipes, and by the time I picked these jeans up to finish them a few days ago, they were super-loose around the waist and hips. *sigh* Now the leg width and length are perfect. So I'm hoping that in a month or two, when cooler weather arrives and I am eating 24/7, I can fit into them again. I wore them in the pics above but am not wearing them today. I'm aware that the jeans don't look like anything special, but that's kind of what makes them so awesome for me. I've had legs too short for jeans for my whole life, and although I can get away with a regular trim and hem for denim trousers, I've always had the "home sewn" look with my jeans when I do that. I've resorted to abrading the new hem on my jeans with rocks and pumice stones before, but let's face it: the original jeans hem always looks best. So first, I selected the side seam that was serged and not flat-felled to unpick the hem, just a couple inches on either side of the seam. 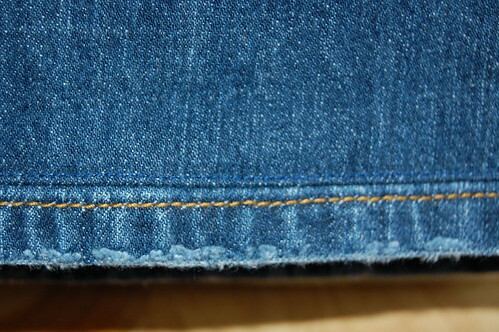 I turned the jeans inside-out and re-drew a straight line from the knee to the hem, and then stitched along the line. I checked that I was satisfied when the leg was turned right-side out, and then I trimmed the new seam allowance and zig-zagged to "finish" it, pressed the new side seam, etc. Then I re-hemmed after skinnifying was complete. All looked good and I repeated for the other leg. 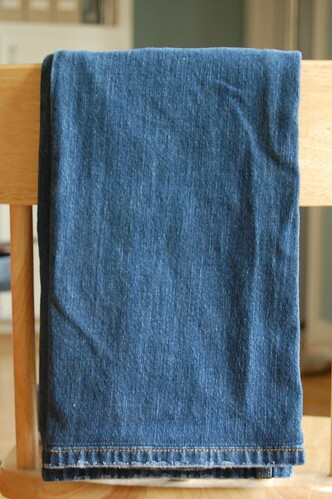 There is a great photo tutorial for skinnifying jeans at Freshly Picked. As for shortening, I have read about this technique for years and was so reluctant to try... the best photo tutorial I've found that resembles what I did is here. 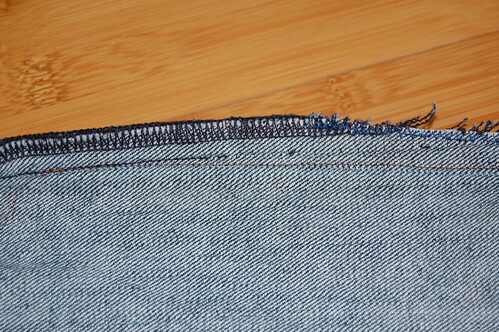 I did topstitch the seam allowance down in blue thread (that is a close color match to the jeans). Here's an up-close shot, but honestly, when you are a couple feet from me, you can't tell at all. They look like regular ol' jeans. Which is a good thing! I signed up for Elsie Marley's Kids Clothes Week Challenge next week. Since I'm actually going to be out of town for most of challenge week, I'm going to sew for Louis this week and post my progress next week to sync with the rest of the participants. I still have a few updates to blog about, so this blog might see more of me the next few weeks -- as long as I can CATCHUPONMYPICTURETAKING. 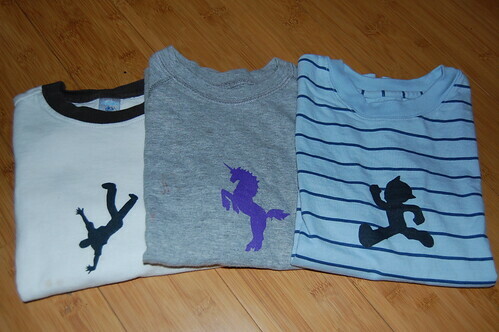 As a warm-up to the kids week challenge, I decided to work on some freezer-paper stencils for Louis (breakdancer, unicorn, and AstroBoy), strategically hiding some stains on the fronts of shirts. See you soon!!! That shirt looks so great! Does it button up the back? Great job on the jeans, I'm always getting asked to hem other people's pants (the sewer's dilemma) and the last time I gave in, I used this technique and was pleasantly surprised by how it really does disappear from a distance. I love the shape of the tank. So chic & simple!! I really like the top too. It looks real cute on you. I'm SO curious about this draping paper on the form thing-- what sort of paper did you use? Wow... great refashion, jeans fix, and stencils! You've been busy! I've been thinking about biting the bullet on hemming jeans this fall too and actually the ones I was considering would look good if I gave them more of a skinny look rather than a flare. You had me cracking up over looking forward to the autumn/winter pounds, but I understand about finding ones that fit perfectly in the waist and thighs! Funny I only ever wear bootleg jeans - nothing else works for me. Love the tank top - but echo Alison's query. Does it button at the back? your tank top looks like a McCalls pattern I've used a lot for my pullover woven dresses and tops. You just saved yourself a few bucks there (in my case it would've save about $15!). And I love working with denim. So much so that I am now knitting a denim-look jacket! You sure have been busy - and it looks like you've been putting all that info to good use. The tunic and jean combo look great. Have not had the experience of clothes no longer fitting because they are too big since, well, forever. it is annoying when things that once fit perfectly now no longer fit although my experience is very much the other end of weight change! Love the unicorn stencil - freezer paper stenciling is on my 'must learn' list. @Wendy - Thank you. Looking forward to making those little changes and trying again in a printed fabric. @Becky - I used recycled flip chart paper - I think the page size is 24" x 36". I had to cut it down so it was a little more manageable. It is still pretty stiff, so I kept the pattern simple (just 1 dart). I did wonder how it would work if I crumpled up the paper to soften it before draping... if the crinkles would misshape the pattern too much... I'll keep you posted if I do this. @Sarah - My sister and I were talking about how we don't want to cook or eat much during the summer. It's just so dang hot! A few days in July, we were really dragging around the house. @Gail - I don't have the figure for bootlegs, I guess. I always thought they'd give me more shape, but it isn't a very flattering shape for me. No buttons on the back, just a CB seam. @Violet - Denim is so stable and predictable! I love it, too. I always love your refashion projects, especially with men shirt. This is another lovely work!! It looks so comfy too. This is the first time I've seen that hemming trick up-close. It does indeed look very subtle. I know about the leg length issue all too well, the jeans store I buy from mostly offers a free hemming service, which they do on a industrial sewing machine and it looks really good, but that slightly rugged hem effect on the original is lost though. I guess they treat the hems with something to get that effect. The shirt looks awesome. & not to be a brat but I wish I had the loose jeans problem! I know what you mean, though--I keep meaning to alter these cords but am planning on running a 12K in December. & I'm certain they'll fit differently by then! @Johanna Lu - Yes, we of short stature are all too familiar with the hem challenge. I used to hem my jeans like I'd hem pants, and I experimented with beating the new hems with rocks and scraping with pumice stones to get a more weathered look. They never looked like the abraded hems that I trimmed off! Oh well, I think this other method will get lots of use from me in the future. @ambika - I can't wait to learn more about the 12k! Good luck to you in training. I've never run farther than a 5k so I'm in awe! you are looking good there! and i love the jeans trick. i will try that. i have some to hem right now. bookmarking your link. the shirt is flattering. good move! !